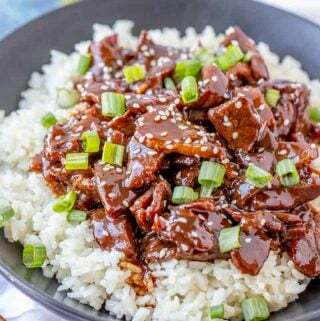 Easy, sweet and full of flavor this Slow Cooker Mongolian Beef is the perfect weeknight recipe to feed the whole crowd. A copycat takeout dish that saves you money! Cut your steak into think strips and then place in a medium sized bowl and sprinkle with cornstarch and toss to coat, trying to coat each strip. In the bottom of a 5qt slow cooker add olive oil, minced garlic, fresh ginger, soy sauce, water and brown sugar and stir to combined. Add in your beef and and stir to coat. Cover and cook for 2-3 hours on high or 4-5 hour on low. To thicken sauce the last 30 minutes of cooking mix together 1 Tbs cornstarch and 1 Tbs water and mix into crockpot stirring around. Replace lid and continue cooking. Serve over rice or noodles if desired.